Travel takes on a whole new meaning when you schedule sightseeing in Cochin. Cochin, or Kochi as it is called in India, is a favorite port of call. As a result, cruise travel to Asia today is a popular activity. If you have never been to an exotic locale like Cochin, expect a travel experience that is a one-of-a-kind adventure. Nothing can replace the initial impression you receive when you discover that the cruise port of Cochin is a truly unique enclave. Sitting and overlooking the Malabar coast in a natural harbor, Cochin offers a tropical and colorful environment to cruise ship guests from all over the world. Although it presents an austere white façade, the Mattancherry Palace – also known as the Dutch Palace – is known for its colorful story-telling murals on the inside. The structure, which was first erected in 1557, became a possession of the Portuguese, who captured Cochin from the Dutch at that time. The structure later shifted back to the Dutch, who renovated the palace. 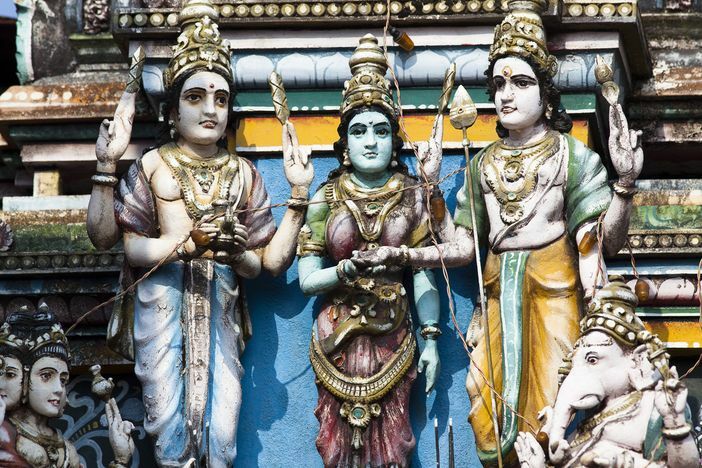 The palace’s murals are distinctive, as they all depict scenes from Hindu mythologies. A gallery of royal memorabilia is also a highlight of the attraction. 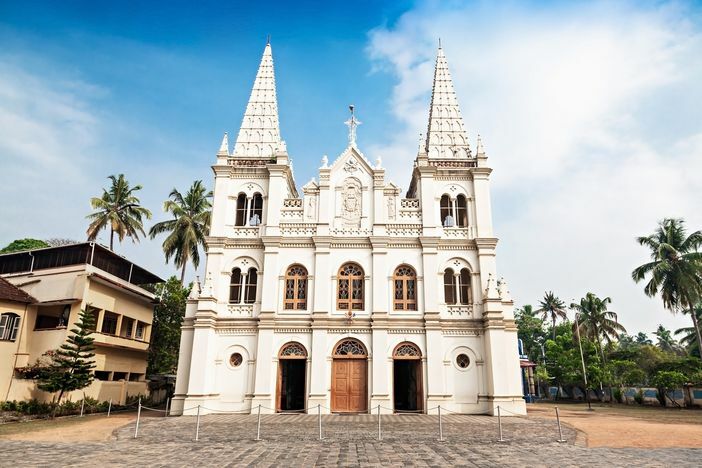 One does not engage in sightseeing in Cochin without visiting the Santa Cruz Basilica, a church originally built by the Portuguese and elevated to the status of “Cathedral “in 1558 by Pope Paul IV. Later the structure was demolished by the British and a new building was commissioned in 1887. Santa Cruz, which was consecrated in 1905, was declared a “Basilica” by Pope John Paul II in 1984. The church – which regularly holds masses – is a must-see Cochin attraction. Fort Cochin is also an ideal site to include when sightseeing in Cochin. Situated north of Mattancherry Palace via Bazaar Road, the enclave expresses a quaint and inviting charm in the form of European architecture – cottages constructed by the Dutch and lavish homes erected by the British traders of the past. A boat jetty, food and beverage stalls, and a bus all sit at the water’s edge. After exploring Fort Cochin, you will want to proceed with your journey by way of a cruise into the Kerala Backwaters – a stunningly beautiful network of rivers, lakes, and canals that weave in and out for approximately 1,150 kilometers. 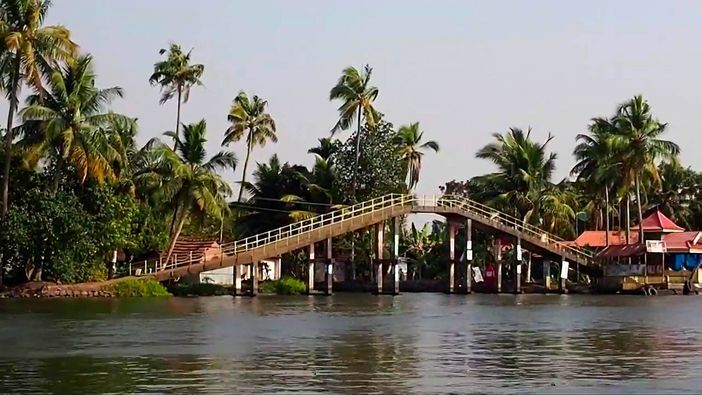 These peaceful waterways give visitors a glimpse into another aspect of Indian life. 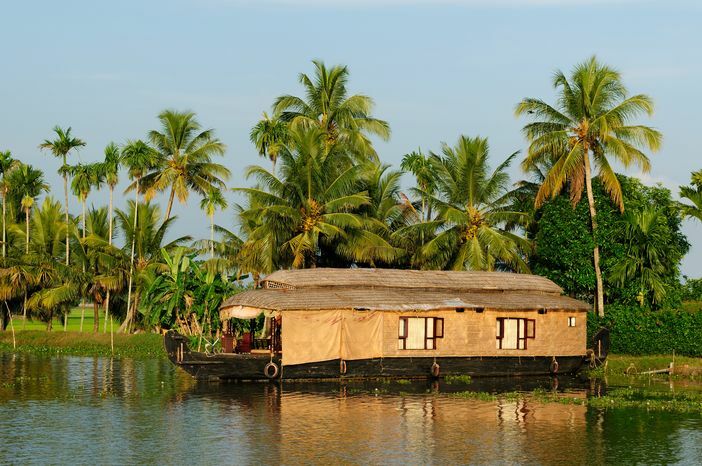 The best cruise tours to the Karala Backwaters feature hand-crafted, thatched-roof houseboats that are designed with up to four rooms. The cruise boats can be hired for one or several days. Also known as the Jewish Synagogue, the Paradesi Synagogue is considered the oldest synagogue in all the Commonwealth of Nations. It shares a wall with the well-known Mattancherry Palace temple. Once cruise guests disembark from their vessel, they can reach the synagogue by auto-rickshaw or taxi. The journey over to the synagogue can be an adventure in itself. 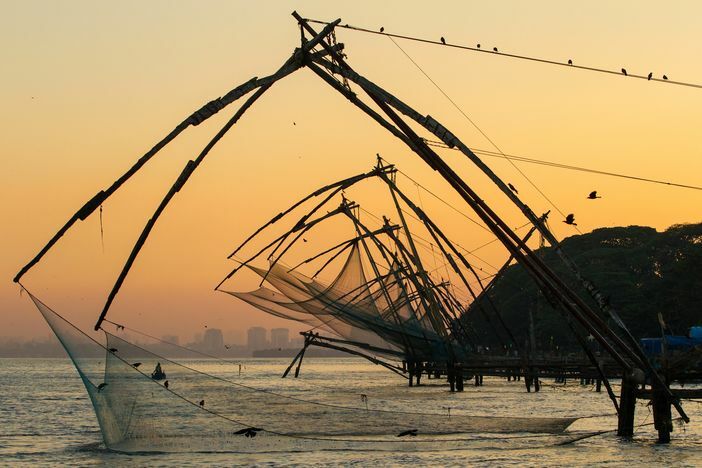 The Chinese fishing nets at Fort Kochi in the Cochin city of Kerala are another unique attraction to visit while sightseeing in Cochin. They are fixed installations along the shore. Set up on poles made of teak and bamboo and held in place horizontally, the traps are lowered into the water to catch fish. The devices look similar to hammocks and feature large stone counterweights that are securely attached to ropes. This memorable museum, which is located in Kerala, is not just any ordinary museum. The facility recounts the area’s history through informative sound and light shows and entertainment. Visitors can see depictions based on the biographies of 87 prominent Kerala personalities. This popular tourist haunt features historical accounts across the centuries. Yet another must-see on an itinerary that features sightseeing in Cochin, visiting the Sree Poornathrayeesa Temple is one of the most exciting things to do in Cochin during the area’s festival time. This is when the temple’s yearly Utsavams – or festivals – take place. 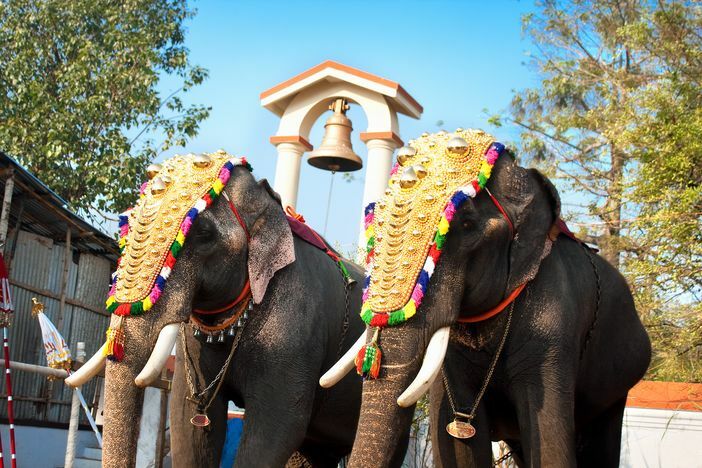 The main celebration is the Vrishchikoltsawam, which is held from November to December. This event is important because it kicks off the Ulsava Season and is one of the largest temple celebrations in Kerala. Therefore, now is a good time to book an Asian cruise – one that includes Cochin, India on the itinerary. You cannot schedule a trip to Asia and bypass this interesting and exotic place. Book cruise travel today and add Cochin to the itinerary.